I would like to apologize for being MIA for a number of days now. When I get sad, I kind of keep to myself, because I do not like bringing other people down with my sadness. That really is not the best way to handle things, but I have the urge to hide under a rock. In any event, I am back. My husband hung a bird feeder outside a window, because he knows I love taking photos of birds. For those of you who just do not know what to do with yourself, because you want to smoke a cancer stick and need something to keep you occupied, I need your help. I am having the hardest time identifying this sparrow. I would appreciate you guys helping me try to figure out what kind of sparrow this is. I have lots more images if you need them to figure this out. I am leaning towards the Chipping Sparrow, but I am not quite sure. HELP, I need somebody! All you old time quitters, please feel free to join into this discussion. Thank you, and I promise it will keep your mind occupied and off wanting to smoke a cancer stick. Try it, and you might even like it! Glad you are feeling better - but do know you are missed when you go into hiding! We can handle a sad Rose - so vent whenever you think it might help. ...and yours has a thinner beak! Mine has a fat one. hmmmmmmmmmm? I didn't find any others with that rusty colored cap and no black bib. Perhaps there is some hanky-panky showing up in its gene pool???? You know, Youngatheart.7.4.12 , funny you should mention that. I asked my husband if he knew if sparrows mess around with other sparrows, i.e., like a tree sparrow getting together with a marsh sparrow. He looked at me like I was totally insane, and I was totally serious. Anyway, he said he did not know if that went on. I don't know if they mess around with the other named sparrows or not. hahahaha You can tell they are all sparrows, I just never realized there were so many different kinds. I guess I should mention that this is a South Carolina sparrow. These little guys are all over the place here. Maybe they're both the same species but one is male and the other is the female. Looks like it could be a male and female in this photo. OR Are they different kinds of sparrows? There are bunches of them around. You are lucky the squirrels don't move onto those seed ledges and clean you out!! I can't lug the bags of seed anymore, nor can I go fill it when the weather is bad, so I got a heater for my birdbath. My neighbor feeds them and I keep everybody watered. They will still bath she it's below freezing out! Amazing! I think your photo is a male and a female, and most of the pictures don't tell you which it is. I think the dark line running through the eye is key! Youngatheart.7.4.12 , I will take a photo of the contraption my husband rigged to keep the squirrels out. I might mention that they still get into that feeder, but we have this juvenile red-tailed hawk that is taking care of the squirrels. Their populations are slowly dwindling. 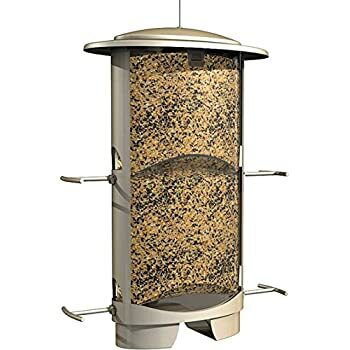 This is a photo of just the bird and bird feeder itself. When you see how he has it rigged, it will make you laugh. Looking forward to it! I used to feed peanuts (and other quality nuts) to the squirrels, but had to stop when I overslept one morning and one chewed its way through a screen to get it himself! He made quite a mess and racket! I had to confront him to get the back door to stay open so he could find his way back out...don't want to do THAT again!!! !They look much healthier and seem much busier now that I don't feed them anymore. I will put out a seed cake and suet when the weather is particularly awful just to give everybody a treat. Guests coming. No time. Remind me. I look around but didn't find a match that was quite right. Mike.n.Atlanta , that is what I thought it was. Then, then I saw all these different type sparrows in books, and started questioning my pick. Want to see the husband your contraption made, uh... reverse that. The brain is a funny thing! I have a squirrel proof bird feeder. You can get them at Lowes. At least a couple of years ago you could. They actually work. Well..... except for the fact that they can hang from the top over the side without touching the cross bars. Can you guys see it hiding in the Spanish moss? Yes! I can see that beauty amidst the moss! And yes, it does work. When they get down to the bars where the birds hang out on the sides, it's spring loaded and their weight forces it down which covers the feeding holes and they can't get to the food. Though I did have one squirrel who figured out if he clung to the top wire with his rear feet and dangled over the edge (without pressing down on the side bars, he could eat upside down. Clever bugger! The squirrels I have around here would be demonstrating the technique to their friends in record time, and the feeder would be empty by day's end. I can see the hawk - marvelous - except, maybe in the squirrels' eyes! Handsome! Love the photo - and the trees!!! Yep, Giulia and Youngatheart.7.4.12 that pretty bird has been taking care of the over-populated squirrels around here. I kind of feel bad for the squirrels, but not too much, maybe, the little, younger ones, yes. Well, I kind of feel bad for all the squirrels, but they are such pests. UGH! Hawks have to eat too, right? That photo was taken a few days ago before the rains started, but you can see the cloud cover. Hopefully, tomorrow it will stop raining, and I will take a photo of that hilarious contraption my husband made. In Baltimore, we had 65" of precipitation by the middle of November, making it the wettest year since they have been keeping track.....and we have gotten two systems of an inch or two since then. The current storm may also dump as much as another 2" - 3" more. Make it STOP!!!!! My sump pump is trying to find a white flag to surrender!!! I'll pay the shipping if you catch that hawk and send down here to TN. I've got two squirrels currently sharpening their teeth on our cedar siding. Literally. And we just had the house painted last summer. They're destroying it. The exterminator wants 600 bucks to catch them. We intend to have the trees trimmed around the house, but it hasn't stopped raining enough and the ground is so sodden the bucket truck would sink into the lawn and destroy it. Caught between a squirrel and a hard place. I've tried to trap them to no avail. GRRRRRRR. Youngatheart.7.4.12 I AGREE, make it stop! Rain rain and more rain! Can you reach (from a window, maybe) the general area where they are chewing? If you can, put up Bird Repellant Tape (3" strips of shiny and strong cellophane film you cut to 12-18" lengths) that flaps in the breeze. I had woodpeckers making 1/4" holes in my cedar shakes in a couple of places...we put a couple of strips of this up in the general area we could reach (with tape in the center for the nail to go through) and it solved the problem. Have to replace it from time to time, but it flaps and makes noise and the critters don't much like it! Might work?? Did you know that the Eastern Gray Squirrel was introduced into Great Britain for sporting purposes. The Brits feel they've made a mistake as the squirrels are quite loud, obnoxious & a huge nuisance in general. I'll just leave that right there & not mention the comparatives that were made. Squirrels multiply like rabbits. I do love the fox squirrels though, but they were run off by the Eastern Gray Squirrels you speak of. We used to have the fox squirrels around, and they are so very cool. I read where those pesky gray squirrels will run off the fox squirrels. Giulia ,that juvenile red-tailed hawk circles the house all throughout the day now, and the squirrels are, let's just say, disappearing. We used to trap them, and take them up the road for release, but I swear, they come right back to this yard. UGH! There are three of those plastic things going up the pole. Isn't that dove pretty though? I love mourning doves. I took that photo from the window inside the house. My husband hit water four inches deep while digging the hole for the post to go into - talk about rain. UGH! I do have a .22 rifle that will work wonders on your house nibblers. Well, that is an awesome thing to make with your photos - a calendar. Pretty photo. For being so adorable, they are very destructive little critters. They will even dig up your daff bulbs. They got mine. I had to buy new bulbs to plant. We had bald cypress seedlings growing on the back deck, and they ate them. Very, very destructive they are. I used to hear them running across the roof of the house every morning and evening, but I feel sure that pretty bird took care of them. I do not hear those little feet anymore, ever since I heard a big thump a few times on the roof. Hope the talons did not put holes in the asphalt. P.S. I had the branches on trees near my house trimmed to keep the squirrels from running across my roof - and those suckers are proving they can jump 8-12 feet - so ya' better REALLY prune them away from the house!!! I know they can jump 12'. I'e seem them do so. There are several trees close enough to the house (one a 60' tulip poplar) that they could just leap from the trunk onto the house. But I'm hoping that when the branches they usually take are trimmed, it will make it a bit harder and be a bit more discouraging. I'll try that Repellent tape. Thanks for the tip!!!! No I didn't know that! Watched one yesterday climbing a tree with half an apple in his mouth. Another time while eating dinner I looked out the window & saw one sitting on our fence with 16" tortilla. They eat the wild mushrooms that are deadly to humans. I love watching them play. I used to have a huge vegetable garden, and those guys used to grab the tomatoes off the vine right before they were ripe enough for me, and try to carry them up a big tree in my backyard. They could never quite make it...and there were often huge tomatoes with ONE bite out lying at the base! Buggers! Youngatheart.7.4.12 , I've been there before too. One time, I thought they were in the attic. I had to go up there and be sure the eaves were in tact. BEAUTIFUL picture. What camera are you using? I have a Nikon Coolpix P90 digital. I've had it for about 10 years now. Fox squirrels are SO COOL. I've seen one on rare occasions around here and I almost jumped out of my seat the first time. They're amazing looking. They are so photogenic. It's like they enjoy posing for the camera. You can walk right up to them. They just sit there looking at you. I love their color and that huge fluffy tail. The doves are ground feeders, so are VERY vulnerable. I remember when I 'd be watching them, and all the other birds would get spooked and fly in a myriad of directions and the doves would be like, "HEY, guys! Where dd everybody go ? What's up, huh?" idk if they are really that dumb, but they sure appeared to be to me! Youngatheart.7.4.12 , They are very laid back. When I see the hawk flying around, I go out there and let the doves know that it's time to break up the party. My mother-in-law was looking out the window one day, a long time ago, and while my husband was pointing out the doves below the kitchen window to her. All of a sudden, this hawk came crashing down from the sky, and they got to see a huge puff of feathers. I know it really upset my mother-in-law. My husband thought it amusing, and she did not like it one bit. Perhaps they were bred that way - there must be predators and prey in the natural order of things....it's why rabbits breed so rapidly. Thanks for the camera info.